Promotional poster showing all of the posters in the series. The Third Eye also put out a series of postcards and jigsaw puzzles with the same designs. 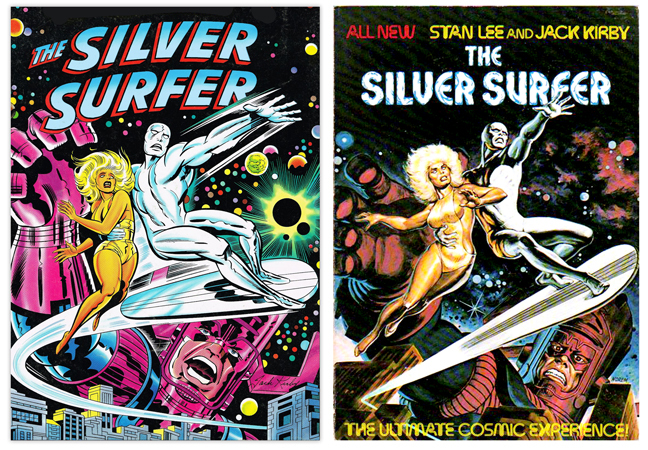 Overall, the combination of Marvel’s illustration superpowers with the psychedelic mindset (the third eye enables metaphysical sight, in mystical traditions) was extremely successful and influential. Not all of the posters are winners (Spider-Man doesn’t really fit), and the exclusion of Steranko’s Nick Fury is unaccountable. Jack Kirby’s Fantastic Four (below) is probably my favorite. You can see close-ups of most of the posters here. You can see original Third Eye designs here. 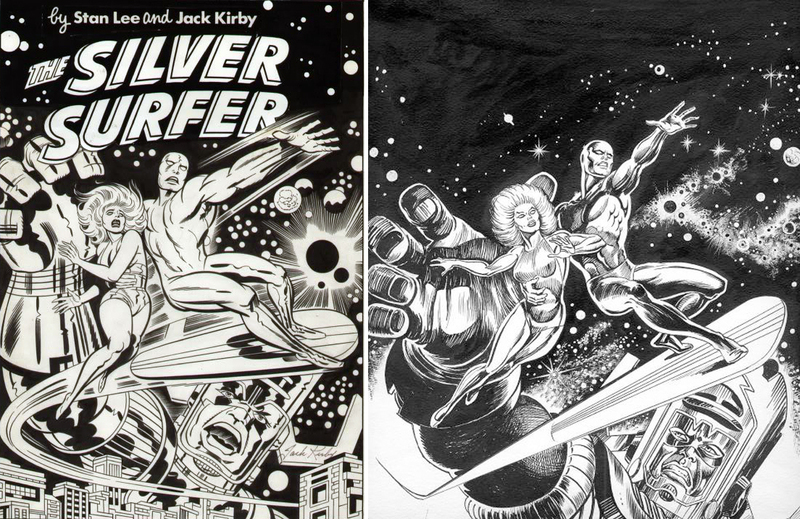 You know you’re good when you get asked to redo a Jack Kirby cover. All but one of the Fireside books were color reprints of classic (i.e. pre-1970) Marvel titles and storylines. This one was the exception—an all new graphic novel by Lee and Kirby, and a damn good one that I remember reading and still have. 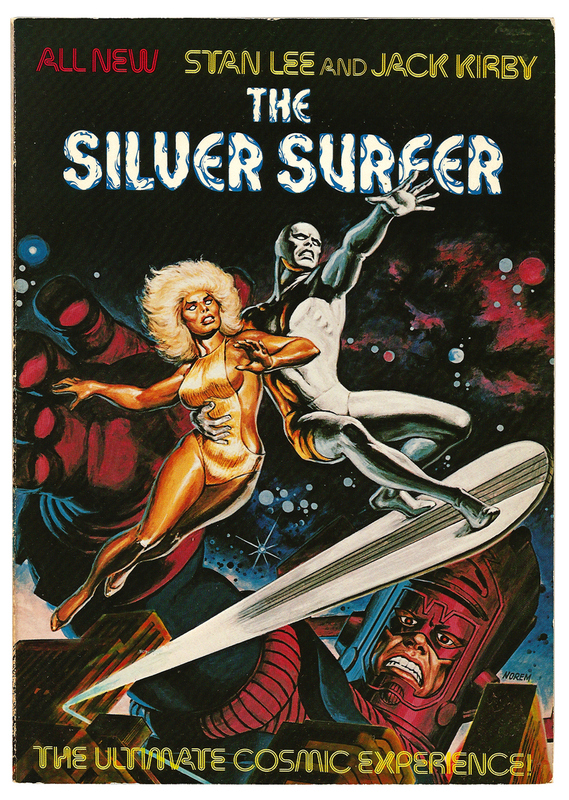 The “Origins” books were a particularly hot commodity at my elementary school, and the Surfer was way up there too. Probably my first exposure to Norem’s work. Check out ‘Tain’t the Meat for more on the Surfer issue and the Fireside Books series. Richard Alf, at age 17, co-founded (with Shel Dorf, Mike Towry, and Ken Kreuger), chaired, financed and organized the first San Diego Comic-Con in 1970. 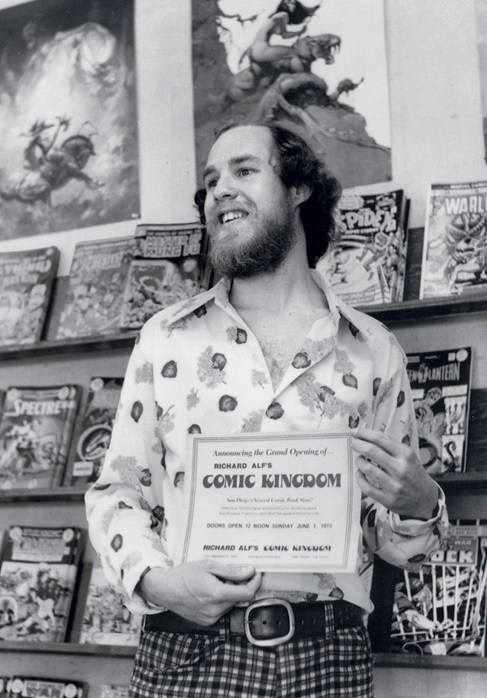 Above: Alf at the opening of his comic book store, Comic Kingdom, in 1975—a great year for comics. Those are Frazetta posters on the wall. One of Alf’s notable achievements was expanding Comic-Con to include the fantasy and sci-fi genres (Ray Bradbury appeared and spoke in 1970). 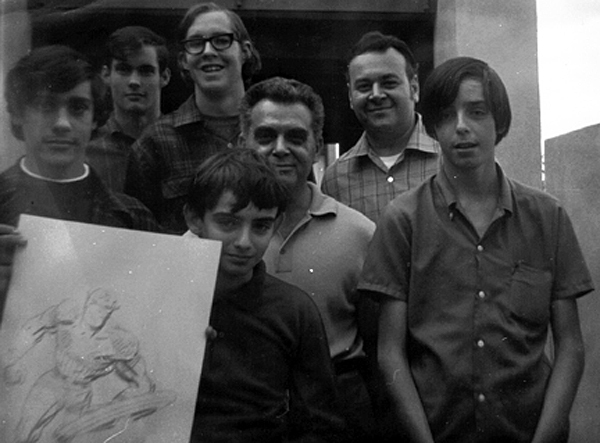 Below: Alf (in glasses) with Jack Kirby and fans in 1969. Shel Dorf is second from right. I’ll post some early Comic-Con photos later today.